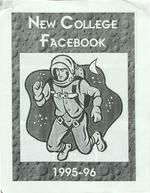 Twenty eight page student catalog (known as the Facebook) featuring photographs of students who were entering their first year at New College. I "Shazam it's Hazen!" Wendy Coulter Neil Israel Mercedes Paulino, Damnit!